Samba:- Even though the Indian government is trying to push the narrative that there were no attacks on Kashmiris after Pulwama attacks, the reality is much different. On February 25, tribals from the Gujjar minority community were thrashed by a group of right-wing activists in Samba district in Jammu. According to reports, two local tribals: Mushtaq Ahmad Chowdary and Mohammad Ashraf Chowdary were on the way to their destination when an RSS mob caught hold of them in Vijaypur area of Samba and forced them to chant “nationalist slogans”. 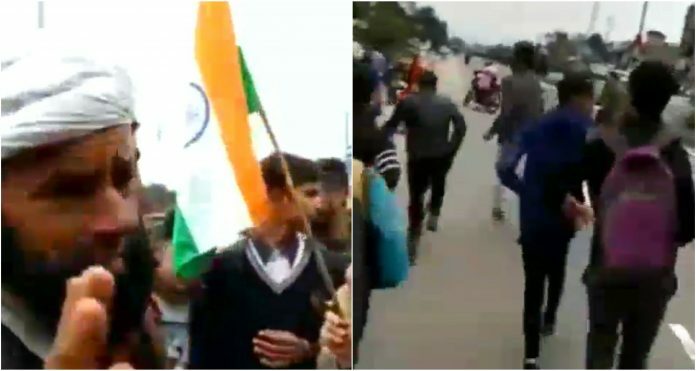 A video of the two being thrashed and being forced to chant slogans in favour of “Bharat Mata” and against Pakistan went viral on social media with netizens demanding authorities to take strict action against the culprits. Anger is brewing among the local Muslim community of the area against the hooliganism of the right-wing activists with locals calling for a peaceful protest against the harassment after Friday prayers this week. Talking to TwoCircles.net, Nazakat Khatana, a Gujjar activist from the region said the duo were waiting to board a bus to reach their destination when the incident happened. He said the RSS workers were celebrating the airstrikes by Indian Air forces against Pakistan when they caught hold of the duo and thrashed them. “We raised the issue with the concerned Police station; you can’t force anyone to chat Bharat Mata ki Jai. Although we have been assured that strict action will be taken against the culprits but we have decided to hold a peaceful protest march after Friday prayers this week”, Khatana says. He said ever since the Pulwama attack the Muslims in the area are being provoked deliberately by the Hindu-right wing parties. When TwoCircles.net raised the issue with Dr Koshal Sharma, Senior Superintendent of Police, Samba said the police have taken cognizance of the video and have started an investigation. “We are verifying the video…strict action will be taken against the culprits after the investigation,” he added.